Jelly Shot Recipes | Jelly Shot Test Kitchen: Fire Breathing Dragons . . .
Fire Breathing Dragons . . . It's a little bit Spicy, it's a little bit Sweet . . . its Marie Osmond a Fire Breathing Dragon Jelly Shot! Hello at long last. I hope you all aren't too cross with me for lack of posting - have missed all of you terribly. I was hoping to pin my lack of posting on Intern Doug and his maniacal-ly chaotic ways, but that would be wrong, wouldn't it? Isn't that how things go in Corporate America? Praise moves up the chain, and blame goes down? Or do I have that wrong. Oh well. Hope you all enjoy the Fire Breathing Dragon! I am thinking that one could use jalapeno vodka in this recipe, and omit infusing with fresh jalapeno, however weighing the cost of a pepper versus a bottle (not to mention the shelf space) infusing seemed the way to go. P.S. Cake Month I promised, and Cake Month you shall have. New recipes to follow next week! XO. The recipe below uses a standard non-reactive glass or metal loaf pan (about 4" x 8"). Click here (under Ensuring a Good Impression) for instructions on silicone molds! Pour into loaf pan or molds. Refrigerate until fully set (several hours or overnight). To serve, cut into desired shapes (or unmold). 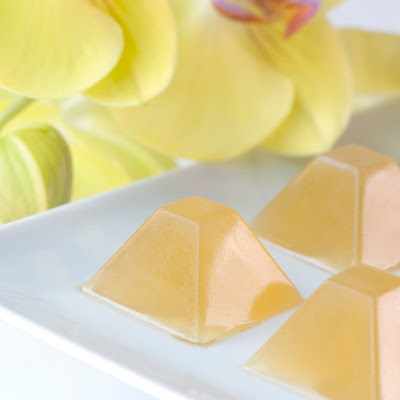 Pin an orchid behind your ear and enjoy a jelly shot!